RISE: Refugees, Survivors and Ex-detainees is the first refugee and asylum seeker organisation in Australia to be run and governed by refugees, asylum seekers and ex-detainees. "Nothing about us without us"
On behalf of our members and governing staff from over 30 of the refugee and ex-detainee communities in Australia, RISE urges the Australian public to say NO to utilising refugees and asylum seekers as political currency in the upcoming Federal election 2016. RISE requests the Australian public NOT to vote for any political parties that support detention centres; doesn’t matter 1 day or 30 days or 1 Year or more. Since ex-prime minister John Howard’s election campaign in 2001, anti-refugee boat rhetoric has been used as a destabilising wedge to win votes and distract the Australian public from core issues of governance. That year, John Howard won the election after starting a deliberate disinformation campaign about ‘The Children Overboard’ affair painting asylum seekers who arrive by boats as ‘queue jumpers’ – unscrupulous illegal entrants without morals, even capable of throwing their children. The two main parties, Labor and Liberal continue to legitimise this strategy, and it has won them the last five elections. This has resulted in the continued exploitation of anti-asylum seeker hysteria stirred by politicians themselves. RISE believes that this aggressive culture of xenophobia and fear of immigration prevails throughout Australia-perhaps attributable to Australia’s foundation of white colonisation including population control mechanisms of the ‘White Australia’ policy to police who comes into the country, and the circumstances in which they come. It is alarming that after the trauma of fleeing one’s homeland, the trauma of indefinite and prolonged administrative detention and the trauma of settling into an unfamiliar environment, people are expected to deal with such overt anti-refugee sentiments all over the country. Say no to abusive and institutionalised controlling of refugees during this federal election. It is not up to us to promote or endorse any political candidates or political parties. At the same time, we are not going to stay silent when political parties explicitly support mandatory detention policies or discriminate against our refugee community groups arriving by boats to seek protection in Australia. So far, the three major political parties in Australia: Labor, Coalition and the Greens support mandatory detention. Labor and Coalition have been implementing mandatory detention policies, turning back boats, as well as offshore detention centre policies. On the other hand, the Greens have a mandatory detention policy of “30 days” for “security and health checks”. We find this to be xenophobic and discriminatory to our freedom of movement; such types of abusive and institutionalised control of refugees should not be tolerated. We refugees, asylum seekers and ex-detainees at RISE oppose any policy that supports detention and will not compromise on the human rights, freedom and dignity of our community members . RISE requests the Australian public not to support any politician who supports mandatory detention; doesn’t matter 1 day or 30 days or 1 Year or indefinitely. Are hospitals a safe space for refugees and asylum seekers ? No it is not – written by an ex-detainee and refugee. Asylum seekers and refugees have been escorted by guards to hospitals with handcuffs and remain so while waiting for the doctors. Quite often they have to talk to doctors when the guards are present. Are hospitals run by the department of immigration, border force or medical staff members? When we talk about immigration do we talk about how the medical industry supports racist refugee policies. Many Doctors and nurses don’t have the courage to tell the immigration guards to leave and promote dignity instead allowing the ongoing criminalisation of our community. Where is the respect and dignity for refugees and asylum seekers within the hospitals in Australia? Are these medical staff working for immigration department putting refugees under the bus while claiming the medical sector is inclusive and safe for everyone? Some of these doctors and nurses talk loudly against detention centres and children in detention but let the immigration department treat asylum seeker and refugees like criminals within their premises. We refugees and asylum seekers not only fighting against Australian racist refugee policies but also xenophobic places like hospitals that perpetuate violations of our rights on a daily basis too. Australia marks its fourth year implementing one of the most racist refugee policies (the “no advantage” policy). The government continues to vilify and defame our community members while holding them hostage offshore, on Nauru and Manus Island, resulting so far in four deaths and untold misery. This is not something we take lightly. This cruel policy has impacted, and will continue to impact our lives physically and psychologically. The Australian government and politicians rely on the complicity of “humanitarian” agencies, such as Save the Children and the Salvation Army, in order to implement racist and inhumane refugee policies. In 2015, the CEO of Save the Children Australia announced that refugee advocates should accept that the turn back of refugee boats are “here to stay”. Offshore detention jobs have even been advertised by “Ethical Jobs” in Melbourne. Who is accountable for all of this? Furthermore, as we continue another year of over 60 million people forcibly displaced across the globe, one of the highest numbers since World War II, we should not forget that while the largest number of Refugees in the world come from Syria, the top 8 arms suppliers to Syria originate from the US, Canada, Russia and countries in the European Union. The world ignores the fact that the countries that create the most number of Syrian Refugees allow the least number of Refugees to seek safe haven within their borders. These very same countries also control most of the funding and decision-making that shape refugee programs across the globe. While there are global efforts by both governments and NGOs during “World Refugee week” to make us sing, dance and perform for them as they momentarily “celebrate” our existence, thus far, we have not witnessed a global effort by these entities to stop feeding the deadly “border security” and military industrial complex, and provide safe passage and sanctuary for Refugees crossing borders. With most refugee signatory countries trying to block borders and deport Refugees to danger, what exactly is left for us to celebrate here? The escalating vilification and abuse of Refugees? If refugee week is about us, it should be about OUR freedom, OUR voices, OUR lives, OUR future and OUR self-determination. We should not be remembered once a year as passive entertainers to satisfy the public’s ego, or as “success stories” to satisfy the diversity checklist. RISE will not partake in, nor “celebrate” or endorse, any events that increase or prioritise non-refugee voices as part of a cheap PR stunt. Refugee campaigns that promote the opportunity to temporally occupy a minuscule segment of refugee, asylum seeker and ex-detainee lived experiences- within constructed, artificial recreations- are an exercise of privilege, not an act of solidarity. Experiential-based campaigns rely on the philosophy of “standing in the shoes of a refugee” as a strategy which seeks to produce empathy, on behalf of refugees, by inviting or forcing individuals to experience part of the physical and emotional discomfort that refugees may experience. Examples include performances that use audience participation as a technique to recreate the limo of waiting upon an asylum claim or aspects of detention centres – for the audience to experience as part of the artistic performance. Standing in the shoes of a refugee” is a fallacy that novelises our experiences. Experimental-based campaigns that draw from the logic of “standing in the shoes of a refugee” are often the creation of white liberals in a misguided attempt to demonstrate solidarity. The fallacy draws its merit from a logic which argues a causational relationship between presenting temporary, constructed, sensorial experiences as an act of solidarity, empathy and critical understanding. However, in centring the singular experience of the individual undertaking such a campaign, it actively silences the voices and experiences of the community going through the experience on a daily, ongoing basis.It exercises the privilege these bodies have in choosing to temporarily dwell within certain identities. The strategy also fails to provide a reflexive analysis of socio-political positionality,instead catering to the spectacle of the event, which ironically, through rations, actually feeds ego and self-appeasing consciousness rather than being a practice of consistent allyship. 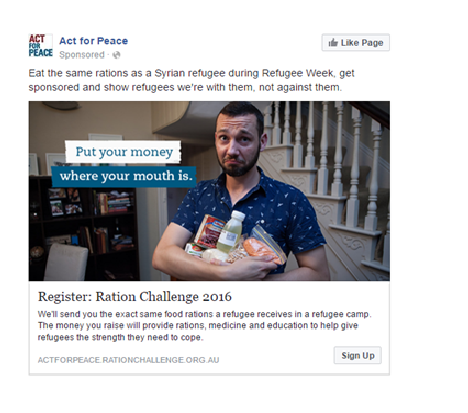 In this way, such campaigns mask the systemic nature of contextual refugeeness. The strategy fetishizes and individualises the multitude of collective experiences of our community- packaging our entire, ongoing, real experiences,literally intobite-size, palatable novelties. Experimental-based approaches privileges the humanity, bodies and consciousness’s of certain bodies over others.Essentially such campaigns centre the white experience as lens and medium by which to measure the experiences of bodies considered ‘other’. They perpetuate a toxic, pervasive dynamic in which the suffering experienced by the ‘foreign’ body, needs to be translated, validated and legitimised through the white body.“Standing in the shoes of a refugee” thus premises the white body as the neutral unit of measurement- reiterating dominant discourse, norms and power-dynamics. Questions about recreating scenarios aside, how does a slice of our experience tell you anything contextually meaningful outside of your singular sensorial moment? Occupying that identity, without the burden of actually carrying it, is offensive and problematic. Why must you stand in our shoes, jump in the ocean or eat rations for a week? Is the fact that these experiences exist; despite through ‘othered’ bodies, not enough? Why must the experience be reconstructed, restaged, as isolated incidents all so that you can experience it through your body and consciousness? Standing in the shoes of a refugee”, is thus the epistemological re-centring of bodies deemed more important. Essentially such campaigns become about you and your experience rather than developing your understanding of how to support self-determining processes. The entire premise of understanding refugeeness through momentary occupation, as this presumption by Griffin demonstrates, does not go as far as challenging your own positionality to exercise the privilege in the first place. The strategy acts instead as a way to manifest pervasive curiosity and uncritical good intent in the form of stranger fetishism. The individual knows they are not a refugee outside of the framed event and thus social roles, existing boundaries, essentialisms and reductionisms remain unchallenged. Campaigns based on the promotion of the experiential orientate itself as a compassionate, humanitarian act of helping ‘the refugee’, yet all the while affords no place for us. It is a discourse in which, precisely within the very inclusion process, remains inherently exclusionary. Such campaigns demonstrate the very voicelessness of our community is the effect of refugee discourse rather than the lack there of. It demonstrates the ways in which our visibilities are constructed and managed within the process of conditional inclusion. Experiential-based campaigns market momentary, temporal, spatial occupation in a manner which fails to adequately frame these experiences within contextual, systemic understanding- all whilst legitimising the lens carried by privileged bodies. Ultimately campaigns such as the Ration Challenge, are an act of superficial solidarity, artificial advocacy and constructed compassion within a temporary performance of humanitarianism. Refugees coming to Australia are being indefinitely detained both onshore and offshore, involuntarily deported back to their countries to danger and physically and sexually abused in detention centres. As refugees, asylum seekers and ex detainees in Australia, we acknowledge that the land we seek protection on is the land of Indigenous peoples. In order to recognise the plight of refugee arrivals to Australia, as well as the ongoing struggle for Indigenous self-determination, First Nations Liberation, RISE and WAR will hold a solidarity event in Melbourne on the 16th of July at 1pm, State Library of Victoria, 328 Swanston Street, Melbourne. On this day RISE, on behalf of the refugee community, will acknowledge Aboriginal Sovereignty over this nation and stand in solidarity with the disposessed First Nations of this country. We commit to fighting for justice on the terms set by Aboriginal people and nothing else. On behalf of Sovereign House, elder Robbie Thorpe will present passports to RISE members. Issuing Indigenous passports to refugees sends a strong message: Under Indigenous law, refugees are WELCOME to this land. RISE will also outline a 10 points pledge which consists of how Australia (government & non-profit sector) should treat refugees arriving to Australia on boats.